gardening | A City girl gone Country. So, since we moved to the country, I haven’t had that much luck growing things. In fact, my gardening mojo has somewhat left me, and more than likely moved back West, to where it is relatively warm all year round. Where we are now? It gets cold, real cold in winter, and as a gardener, I have to deal with sub-zero temperatures at night and frost and very occasional snow/sleet. In essence, I have completely altered growing regions from Mediterranean to Cool Temperate. This means I can’t just grow the things I used to grow in my garden on the West Coast, especially in winter. Some of the vegies just wont get through the frosts we have up here. These are a punnet of snow pea seedlings (at the back) and about a third of a punnet of spring onions that I planted up this afternoon. 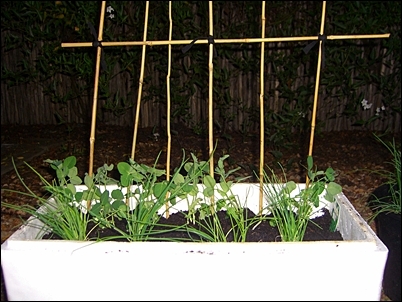 They’re in a styrofoam box that had no more use at my workplace, so I filled it with some new soil that I picked up at the garden store this afternoon, and transplanted the snow peas from their punnet, and the spring onions from their two way-too-small pots. Snow peas like to climb (as do all in the pea family: sweet peas, snow peas, green peas, beans) so I’ve rigged up a climbing frame behind them for them to latch on to as they grow.